Two years ago, the pain both in my shoulders and neck had reached a crisis point. Although I was able to do some taiji (tai chi) exercises, by late afternoon each day I had severe aches and pains all over my arms, down my neck and in my upper back. I needed answers and I needed relief, so I decided to get an MRI of my neck. The test revealed cervical stenosis and two herniated disks. The news from a shoulder specialist was not much better — no cartilage in my left shoulder joint, just bone on bone. And, my right shoulder had a torn rotator cuff which was responsible for the pain down the front of my right arm. The shoulder specialist was impressed that I was able to do some joint rotation exercise. He suggested I continue taiji for 3 more months (if I didn’t have pain during the exercise) and return back for an evaluation. Over the preceding months, my taiji practice had been sporadic. Some days I did nothing because of pain, which I would realize later on was a mistake. It was now decision time for me -- practice taiji seriously, every day, focusing on slow and healing movements or give up and simply resort to surgery. The choice was obvious to me and I restarted my daily practice with a new commitment. I made sure that standing meditation became the staple — every day for between fifteen and twenty minutes, working my way through the numbness and tingling that was present each time I lifted my shoulders. After four straight weeks of standing meditation, the numbness and tingling stopped, and now, eighteen months later it has never come back . . . 100% gone. To my disbelief, the pain down my right arm also disappeared. It too has not returned. I shortened my daily routine and made it more balanced. Depending on the day and other commitments, I could always find a few minutes in the morning, afternoon or early evenings. I like to start the day with spiral flexibility by doing the “Rising Dragon” as a warmup to loosen the back and shoulders. I follow that in the morning, with energy cultivation, finding that either “Grand Opening” or “Heavenly Spiral works really well. Later on, for internal core strength, “Standing Meditation” is very effective. An all-encompassing exercise like the “7 Form” or even “Cloud Hands” has helped with flexibility. Done slowly, either of those is very healing and feels good. At some point in the day, I like to make sure there are agility and cardio in my practice, and there is nothing better than “Warrior Jumps” or “Hip Openers” to satisfy that need. After dinner, a before-bed session of lying down Meditation allows me to end the day with a healing, relaxing and restorative session that sets the tone for a peaceful sleep. The critical wisdom that guided me throughout this major change in my overall approach to taiji was: “It is better to practice 15 minutes every single day, rather than one hour once a week.” This more than anything changed my healing pattern. I now have a new commitment to do something every single day — even if I am sore. Then, I will go very slowly rather than doing nothing! My pain has been reduced easily by 80%. The days of unbearable pain are behind me. Most days are totally pain-free, and on some days when I feel a few aches, I simply complete my practice and I feel much better! Another good thing is that on the days when I'm feeling really well, with some time on my hands, I am able to try new things to enhance my practice even further. A final key point: I now realize that though healing eventually comes, this is not an overnight cure, but a long-term commitment to feeling better for the rest of my life! 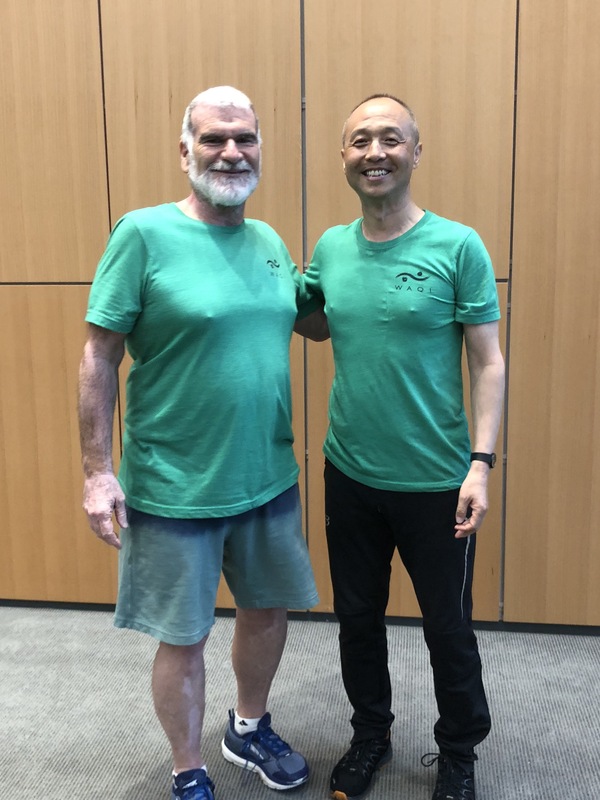 As always, I am looking forward to more fine tuning of my practice during one of the summer’s 5 day programs in July, where these movements are reviewed, and new ones learned. Like tuning up a car, these workshops have become a regular component of my approach to a healthy life. I have seen that I am now able to put pain control in my owns hands by following a series of simple short balanced movements of taiji on a regular basis. Bob Vlahakis retired in 2005 from 30 years of teaching middle school English & Social Studies, and later, in 2017 retired from coaching after 42 years. Soon after having stomach cancer surgery at Sloane Kettering, Bob met Master Yang in 2016 at a 5 day Kripalu workshop. Seeing how powerful taiji could be at healing, he began studying earnestly with Master Yang, now having attended 8 straight Kripalu workshops and two camps last summer. He received his EBQ Certification in August of 2018. He now has a special interest in sharing taiji/Meditation with High School and College Student-Athletes, and recently had an article about that work published at insidelacrosse.com, a National publication. The article is called “Sharing WAQI with LIU Post”. In addition, Bob just started teaching his first class for Seniors on March 1, 2019, which he says has been a wonderfully rewarding experience. He has a new class in the works with Veterans at the Stony Brook Long Island Veterans Home. ©2004-2019 Center for Taiji & Qigong Studies.